기사요약: 한국의 주요 통신사 KT의 건물에서 화재가 일어나 용산구, 마포구등 서울 곳곳에서 통신 장애가 일어났다. 가게안에서 인터넷 문제로 카드결제가 불가능 했고 많은 유저들이 전화와 인터넷 연결 마비를 경험했다. Phone and internet services, cash machines and in-store payment systems provided by KT were paralyzed in parts of Seoul over the weekend after a fire took out key network equipment. According to fire authorities, the fire broke out in the basement of a KT building in Ahyeon district at around 11:10 a.m. on Saturday. It took about 10 hours for the blaze to be completely put out. While no human casualties have been reported, KT’s landline, mobile and internet networks in the area went down after the fire hit communications equipment that was installed in the basement of the building. 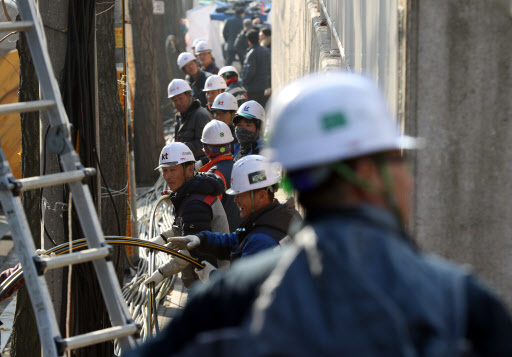 The network blackout affected mostly western Seoul including Mapo-gu, Seodaemun-gu, Yongsan-gu and Eunpyeong-gu and parts of Goyang in Gyeonggi Province. Services remained unavailable or spotty as of Sunday afternoon. Seoul city sent emergency mobile phone alerts about the damaged network system on Saturday, but KT subscribers in the area were unable to receive the messages as phone services were down. 기사요약:올해 수능 영어시험 문제의 난이도가 인터넷에서 화재를 일으켰다. 국내 뿐만아니라 영어권 국가 출신의 사람들도 놀라움을 금치 못했으며 영어선생님들 또한 제 2외국어로 영어를 공부하는 한국 학생들 대상의 대입시험의 난이도에 놀란 눈치였다.